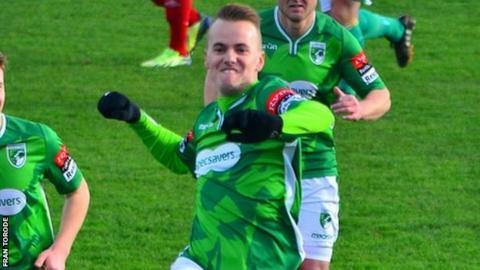 Striker Marc McGrath has been named Guernsey FC's Player's Player of the Year. The 28-year-old also picked up Fan's Player of the Year and won the club's golden boot for his 23-goal haul. Veteran goalkeeper Chris Tardif was named Coaches' Player of the Year while Tom de la Mare took home the Young Player of the Year award. "It's all about the team at the end of the day, you can't do anything on your own," McGrath told BBC Guernsey. "I've been lucky enough to have a little run in the team and we've let a few goals in this year, but when you look at it we've done OK.
"Tenth in the league isn't where we wanted to be, we're looking to be promoted, so next year will be the year," McGrath added.